Ensemble Galilei takes its name and inspiration from the life of composer Vincenzo Galilei, whose influence, some four hundred years ago, helped restore a vital element of passion to the music of the day. Including both classically-trained and traditional musicians, the Ensemble infuses ancient music with a spirit of improvisation and liveliness. 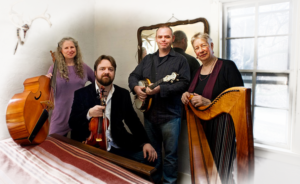 Their performances move flawlessly from lush Baroque interpretations of 18th century Irish airs to infectious reels and jigs, from haunting Welsh melodies to Galician Waltzes and Breton dance tunes, stitching a tapestry of texture, harmony, and rhythm. Virtuoso technique, an instinctive feeling for the idiom, and the courage to improvise…they play with energy, splendid ensemble, good humor and imagination. The music is filled with quiet passion and a lot of strength. If music is the food of the gods, this disc comes from their private stock. National Public Radio's Performance Today said, "There's an ease about the way they play that seems to break down the barriers that normally exist between the audience and the performer." To achieve their unique Celtic sound, Ensemble Galilei has melded the elegance of chamber music with the energy and excitement of traditional music. An intricate blend of instruments—fiddle, Celtic harp, Scottish small pipes, recorders, penny-whistle, oboe, viola da gamba and percussion—grants listeners passage to another world, evoking musical images of the ancient Celts and bringing these images to life for today's audiences. Ensemble Galilei recorded Holiday and seasonal music A Winter's Night on the Maggie's Music label with the musicians pictured above: Liz Knowles, fiddle, viola; Deborah Nuse, Scottish small pipes, fiddle; Sue Richards, Celtic Harp; Carolyn Anderson Surrick, viols, and Sarah Weiner, oboe, recorder. Here is the original Ensemble Galilei when they recorded Music in the Great Hall and Ancient Noels with Bonnie Rideout and Maggie Sansone. Pictured here are Carolyn Anderson Surrick on viola da gamba, Jim Brooks on recorders and Marcia Diehl on recorder, pennywhistle and bowed psaltery and three Maggie's Music solo recording artists: Maggie Sansone on hammered dulcimer, Sue Richards on Celtic harp and guest performer Bonnie Rideout on Scottish fiddle. Currently on national tour, their lineup includes Katheryn Montoya on baroque oboe, recorder and pennywhistle, National Scottish Fiddle Champion (1997) Hanneke Cassel and special guest Neal Cohen from NPR's Talk of the Nation. In 1994 Ensemble Galilei won a Wammie for "Best Chamber Ensemble" awarded by the Washington Area Music Association. Excerpts of their concerts have been heard on NPR's Performance Today over twenty times since 1990, including Christmas Day 1997, plus two in-studio 30 minute concerts there. They have been interviewed by Robert Siegel on All Things Considered and have performed and been interviewed on the Diane Rehm Show.